AUGUSTA, Ga. – Shawn Vincent, former Vice President of Operations for the Oncology Services Division of Hospital Corporation of America, has been appointed Vice President of Partnerships and Strategic Affiliations for Georgia Health Sciences Health System, effective January 17. Vincent will develop and oversee the statewide overarching partnership and affiliation strategies for the Health System, including delivery and management of high-quality, cost-effective services with strategic partners; advancement of off-campus relationships and programs with hospitals, physicians, clinics, foundations, community leaders and branch campuses; and the development of philanthropic and research opportunities. At HCA, Vincent directed operations and strategic growth of oncology services for 164 hospitals in 23 states and England. He also played a key role in the consolidation of the oncology service line throughout the multi-billion dollar organization. From 2002-06, Vincent was Administrative Director of the Georgia Health Sciences Medical Center’s Oncology Center of Excellence. Vincent is a member of the American College of Healthcare Executives and has been included in Who’s Who Among U.S. Healthcare Executives five times. He has served as Chairman of several philanthropic organizations, including the American Cancer Society and the Leukemia and Lymphoma Society. He is a member of Historic Augusta and was a 2006 participant in the Augusta Metro Chamber of Commerce’s Leadership Augusta program. Vincent was also selected as an Executive Fellow of the Advisory Board Company in Washington, D.C., a two-year development program for health care leaders. After serving in the U.S. Marine Corps, Vincent earned a bachelor’s degree in health care management from Appalachian State University in Boone, N.C., and a master’s in business administration from the University of Georgia. Augusta, Ga. – For the second consecutive year, Dr. Ricardo Azziz, President of Georgia Health Sciences University and CEO of Georgia Health Sciences Health System, has been named one of Georgia Trend magazine’s 100 Most Influential Georgians. “It’s quite an honor to be chosen. There are some really heavy hitters in this group, including Fortune 500 CEOs and our Governor, and I am humbled to be included among them again,” Azziz said. Azziz, 53, became the eighth President of GHSU, formerly the Medical College of Georgia, in 2010. Georgia Trend credits Azziz for leading GHSU in Transformation 2020, a strategic growth plan, and for his progress in advancing the academic health center’s reputation as a world-class organization that delivers excellence in biomedical education, research and clinical services. Mayor Deke Copenhaver is the only other Augustan to make the list. “Individuals on the list are selected for the power and influence they wield. These are the people who affect the lives and livelihood of all Georgians in one way or another,” according to the magazine. Augusta, Ga. – Tis’ the season for long check-out lines, but what if there was a way for companies to shorten the wait time at the cash register? In the study, Practical Insights on Pitfalls in Estimating Queue Performance, Todd Schultz and Jim Grayson, professors in Augusta State University’s Hull College of Business, analyze waiting line systems or queuing systems to help businesses speed up time at the cash register. With the use of the Excel spreadsheet Visual Basic for Applications program and the spreadsheet-based application Crystal Ball, Schutlz and Grayson developed over 10,000 simulation modules that would test the standard queuing formula against queuing systems or waiting line systems in various conditions. The results from this study show how the estimated- wait time derived from the standard queuing formula may not be accurate due to factors such as the time of day a business is open or even the amount of time it takes for an employee to complete a task. Grayson received his bachelor’s degree in general engineering from the United States Military Academy. He earned a master’s degree in business administration as well as a doctoral degree in management science and operations research from the University of North Texas. Schultz earned his bachelor’s degree in management science from the Georgia Institute of Technology and his doctoral degree in operations research from The Johns Hopkins University. For more information or to schedule an interview, contact Danielle Harris, media relations specialist, in ASU’s Office of Public Relations and Publications at 706-737-1876. Augusta, Ga.- In observance of the holiday season, all offices, labs, and services of Augusta State University will be closed beginning at 4:30 p.m. on Friday, Dec. 23, through Monday, Jan. 2. The campus will reopen on Tuesday, Jan. 3, 2012. For more information, contact ASU’s Office of Public Relations and Publications at 706-737-1444. AUGUSTA, Ga. – The campus of Georgia Health Sciences University will be closed Monday, Jan. 16 in observance of the Martin Luther King Jr. holiday. Campus will reopen Tuesday, Jan. 17. AUGUSTA, Ga. – Scientists have found at least one instance when the smaller sibling gets to call the shots and cancer patients may one day benefit. The protein Chk1 has long been known to be a checkpoint in cell development: it keeps normal cells and damaged cells from dividing until their DNA has been fully replicated or repaired. Now scientists at Georgia Health Sciences University and the California Institute of Technology have discovered a shorter form they’ve dubbed Chk1-S (“S” stands for short) that essentially neutralizes its longer sibling so cell division can proceed. That shorter form is in higher levels in cancer cells as well as fetal tissue, both of which require accelerated cell division. But the scientists also have shown that very high levels of Chk1-S actually reduce tumor growth and prompt premature cell division and death in other cells. “Chk1 is needed for division of all cells, even cancer cells, so if you inhibit it completely by over-expressing Chk1-S, those cells also will not grow,” said Dr. Navjotsingh Pabla, a postdoctoral fellow at Caltech. Chk1-S expression is nearly zero in normal, non-dividing cells. These findings, published in Proceedings of the National Academy of Sciences, point toward the short form’s potential to help diagnose and/or treat cancer, they said. Chk1 inhibitors, which promote abnormal cell division – and likely cell death – to occur before DNA replication/repair is complete, already are being tested on patients. “It’s exciting to have found an important regulator of such an important protein that we think may contribute to cancer as well as its treatment,” Dong said. Chk1 and Chk1-S are made by the same gene they are just spliced differently. One way Chk1 gets turned on is by phosphorylation, or adding phosphate, which can activate or deactivate a protein. The level of phosphorylation of Chk1 is particularly dramatic when DNA repair is needed. Chk1, in turn, works to temporarily halt the cell cycle by phosphorylating another protein. Interestingly, Chk1-S cannot bind to its sibling when Chk1 is phosphorylated. It’s known that mental retardation can result from mutation of ATR, a DNA damage-sensing protein that phosphorylates Chk1. While the biggest burst of cell division occurs during development, it continues lifelong in areas such as the blood, skin and gastrointestinal tract where cell turnover is high. “Lots of tissues need to regenerate,” said Dong. 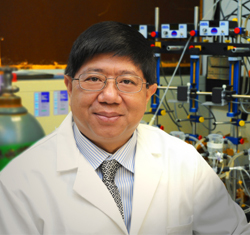 Dong is a Regents Professor at GHSU and a faculty member in the university’s Medical College of Georgia and College of Graduate Studies. He is a Research Career Scientist and Director of Research Development at the Charlie Norwood VA Medical Center. Pabla worked at GHSU with Dong on the study.